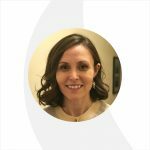 Kathryn Rzeszut is one of Integrity’s Senior Monitoring, Evaluation & Learning (MEL) experts. 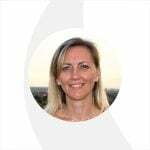 She has been working in the Middle East and North Africa (MENA) region and is relocating from Istanbul, Turkey to join our Washington, DC office this month. Since joining Integrity in April 2014, Kathryn has spent much of her time overseeing MEL projects related to the Syrian crisis response. She designs and implements high-quality MEL systems for stabilisation programming in fragile and conflict-affected states. Her current work builds from her experience in a US Army Civil Affairs unit, where a deployment to Afghanistan in 2002 first sparked her interest in post-conflict recovery. Her subsequent position as a Research Fellow at the Post-War Reconstruction & Development Unit (PRDU) at the University of York, led her to specialise in MEL for stabilisation programming. You are relocating to the US after spending the last five years in MENA. What are some of the highlights from your work in the region? It’s very hard to choose just one. Since September 2014, I had the opportunity to first lead, then serve as project director for a third-party monitoring project for a multi-donor Security & Justice stabilization program in opposition-controlled areas of Syria. The context is constantly shifting in unexpected ways in Syria, so we had to adapt both technically and operationally to meet the changing circumstances. We also had to understand the needs and priorities of several different donor governments to ensure that our reporting was useful and our findings actionable. We built a strong and dedicated team of mostly Syrian staff who really understood the communities where we worked. This was an essential element for understanding the dynamics which impacted the implementation of the program we monitored. Having the chance to work with several different governments and such a good group of colleagues on an interesting and challenging project was definitely a highlight. 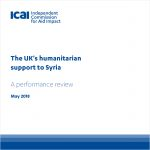 Last year, I also was the team leader for the UK’s Independent Commission for Aid Impact (ICAI) review of The UK’s humanitarian aid support to Syria. ICAI reports to the UK parliament’s International Development Committee and all its reports are publicly available, so it plays an important role in ensuring transparency and accountability both to the government and the British taxpayer. In consortium, Integrity provides technical expertise to ICAI to conduct the reviews. 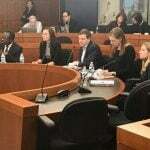 What did you learn from working on the ICAI Syria review? 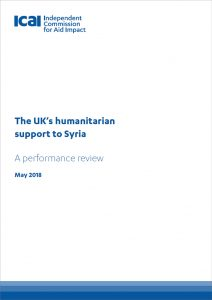 The UK humanitarian response to the Syrian crisis is substantial. As of 2018, the government had provided over £2.7 billion in aid since 2012—so being involved in a review of a portfolio that size and importance was a responsibility I felt keenly. I had the privilege of working with ICAI’s Chief Commissioner at the time, Alison Evans, who was also the review’s lead commissioner. I learned so much by observing how she engaged with the response’s complex issues, as well as the higher-level strategic challenges the UK government faces in humanitarian crises. One of the interesting elements of the review was its use of primary data that my Integrity colleagues in Syria and our office in Gaziantep collected. This was the first time that an ICAI review methodology included data from communities and aid recipients, so in that way it was unique. 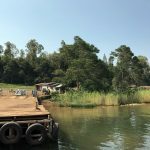 The perspectives from the Syrians receiving aid and their wider communities provided valuable triangulation and helped to demonstrate—even if on a small scale—some of the changes that the aid made in their lives. Engagement with the people in the communities where we work is a cornerstone of Integrity’s work and it was gratifying to be able to incorporate their voices into the review’s findings. So how will your role change with your move to the DC office? I’ve been focused on nearly full-time project delivery since joining Integrity in April 2014. While I’ve been working primarily on the Syria response in that time, I have had the opportunity to lead or support Integrity’s MEL projects in other regions—from conducting a process evaluation of DFID’s remote management practices in its programs in Somalia and North-East Kenya or evaluation and learning support for the British Council’s MyJustice program in Myanmar. As I move to DC, I’ll still be involved in project delivery, like our third-party monitoring platform for DFID’s Somalia portfolio and our new third-party monitoring and research project for DFID’s migration programming in nine countries along the Central Mediterranean Migration Route, but in a short-term technical advisory capacity. This is an interesting homecoming for me after a decade living abroad. Much of my MEL career has largely involved work for other donor governments and international organisations, so this move is such a great opportunity to help build Integrity’s work with the US government, drawing on my experience designing and delivering MEL systems across different sectors and contexts. I’m looking forward to supporting our CEO, Anthony Ellis, and our DC Head of Programs, Kelly Skeith—as well as the rest of the Integrity team—as we expand our US portfolio. I’ll be leading the technical design of MEL projects and engaging with the US MEL community of practice. I’ll also have the opportunity to help build the MEL capacity of Integrity’s junior staff by delivering internal training sessions and through individual mentorship. I’ll continue to collaborate with my other MEL colleagues to finalise and implement our company-wide MEL Strategy. I have a lot of interesting challenges to keep me busy as I settle back into life in DC. And this is also the first NHL playoff season I’ll be able to watch in ten years, so everything about this relocation is pretty exciting! Read more about the opening of our US office here. If you are seeking relevant services and think Integrity can help, please don’t hesitate to get in touch. Our team are always available on usa@integrityglobal.com and happy to take your questions and enquiries.